Hosta ‘Regal Splendor’ is another one of my favorite hostas. This one is especially beautiful with its large, vase-shaped mound of foliage, soft blue leaves with wavy, pale yellow margins, and lavender flowers that tower over the plant on tall scapes. 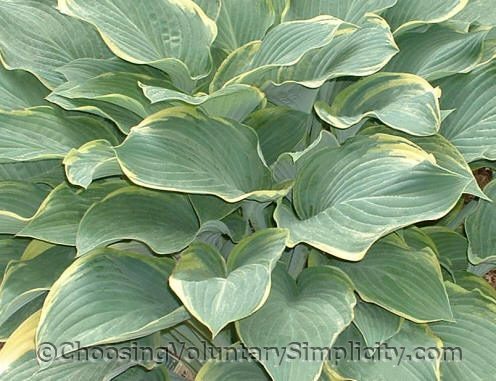 An unusual characteristic of this hosta is that the yellow borders are often much wider near the base of the leaves than they are nearer to the tip, and leaves from different Regal Splendors can have borders that vary quite a bit in width. Although this hosta was chosen as 2003 Hosta of the Year, I didn’t see it as a particularly outstanding addition to my garden for its first few years. However, now that it has matured, Regal Splendor is definitely one of my most beautiful hostas. Regal Splendor is a sport of Krossa Regal. It is sterile and does not produce seeds. This is beautiful. I think I have seen this one at a box store and if I’m correct the leaves are very thick. Because of these photographs I have ordered one from a local nursery. It is a little more expensive than I wanted but it is a good size and of good stock I’m told. Me again – I just wanted to tell you that my Regal Splendor hosta arrived today and it is gorgeous. I am so glad that i was willing to buy a bigger plant. I’m off now to put it in its proper place. Just wanted you to know. 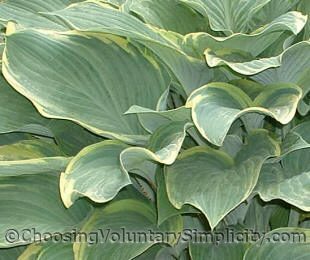 I really appreciate the way you have put down all of this hosta information and your guides to identifying the various types. Along with the photographs I have found your information to be very helpful in my newfound hobby of hostas. Thank-you. I have had a Krossa Regal for many years and last year added the Regal Splendor. They are planted across from each other and are two of my favorites!